The hunt is on for the most detailed histories of people in the remote past that we can achieve. We can now routinely, through Bayesian modelling of radiocarbon dates, construct much more precise chronologies than previously, down to the scales of lifetimes and generations, and even on occasion of decades. Better timing opens estimates of duration and the evaluation of the tempo of change. Rather than the conventional default perspective of generally slow change and much continuity, in blocks of time a couple of centuries long or more, we can now examine sequences that are often much more dynamic, quicker-changing, and from time to time more interrupted and punctuated than we had previously imagined. We can now write much more precise and ambitious narratives about the actions, decisions and choices of past people; the pre- can and should come out of prehistory. Despite the absence of written records, such narratives can be aligned much more closely with those of history and its concerns with the specific and the particular, and can serve to rid archaeology of its addictions to generalisation and fuzzy chronology. Coming out of a recent major project funded by the European Research Council, and with the experience of Gathering Time (Oxbow Books 2011) also behind it, The Times of their Lives sets out this case. It considers the varying timescales of archaeology, history and anthropology, and the construction of precise chronologies. It examines the reach of precision in a series of case studies across Neolithic Europe to do with big themes of settlement, monumentality and materiality through the sixth to third millennia cal BC. It goes on to consider the implications of much more precise chronologies for narratives of social differentiation and change through the Neolithic sequence, and reflects on how to combine the varying timescales presented by turning points in the long term, by the slow time of daily life, subsistence practices and population growth, and by lifetime and generational developments. It ends by looking ahead to a future archaeology, exploiting the best of archaeological science, which can write precise and detailed narratives for the people of early history. 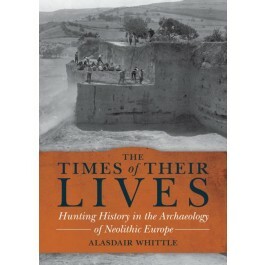 Though focused on the European Neolithic, The Times of their Lives sets a challenge for archaeology as a whole. "[a]…beautifully written, superbly illustrated book…far greater than the theoretical deficiencies which colleagues will continue to argue about. The question for each prehistorian who reads this volume is what they will do about its central challenge."